Baltimore Inner Harbor features a wide variety of activities, from museums and parks to dining and nightlife. It’s a tourist attraction that doesn’t put much focus on the harbor itself, which has been a lightning rod for waste. 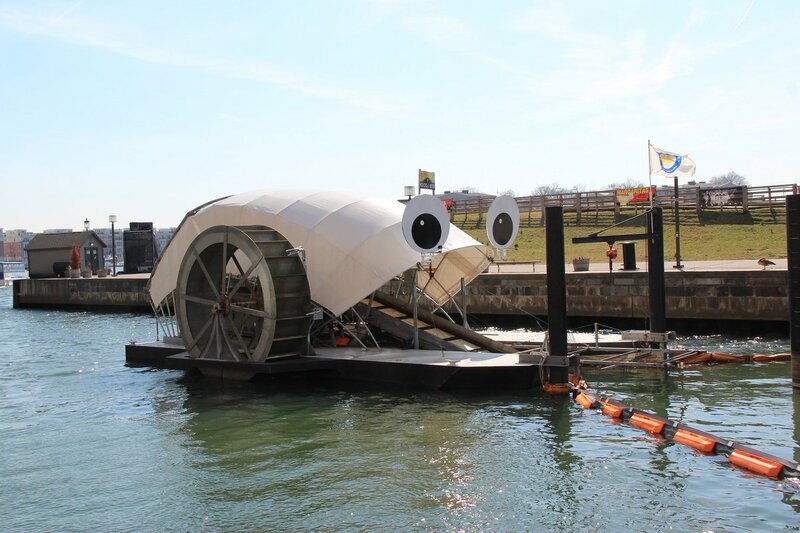 The Waterfront Partnership wants to make the waters swimmable once again, and one of the ways they’re achieving that is with Mr. Trash Wheel. Since 2012, both the Inner Harbor and Patapsco River have recorded failing grades in terms of water quality. Goals to make the harbor itself active by 2020 through the Healthy Harbor initiative look gloom thanks to waste that enters into from sewage systems when it rains. Not only does this affect sea life, but it can create waterborne diseases. One of the most popular initiatives in the Baltimore Inner Harbor recovery is Mr. Trash Wheel, developed by city local John Kellett. This water wheel is fueled by sunlight and water and collect trash that ends up in Jones Falls River. Water currents do most of the work while a solar panel picks up the slack when that source is unavailable. To make things unique, it’s been given a personality with large googly eyes attached. All garbage is disposed of in a dumpster that’s frequently replaced to keep the water wheel constantly moving. Since May 9th, 2014, the project has collected over 1.5 million pounds of trash in the waters, which include bottles, polystyrene containers, and cigarette butts. In one storm, it was able to collect “16 dumpsters of trash” according to director Adam Lindquist. Mr. Trash Wheel has gained a comedic reputation through its personality on social media. Its Twitter account, @MrTrashWheel, has over 15,700 followers with tweets that thank people pledging to pick up trash through a “secret society” called “The Order of the Wheel.” There’s also educational bits to go along with frequent jokes of his jiggly eyes. Because of the project’s success and raising $550,000, there’s a female addition to the family named Professor Trash Wheel. She’s located in Baltimore’s Canton neighborhood and picks up trash in Harris Creek. Also given a personality, the newcomer has already completed college with a “trash studies” degree and can be found at @ProfTrashWheel on Twitter.